Edraw offers you a collection of ready-made home plan templates which you can use in your drawing and free. Edraw provides an easy mean to make home plan. It only takes a few minutes to create wall structure, add furniture, and change the appearance. You will get high-impact visuals to present your ideas. If you want to use a ready made template, go to home plan templates page and choose the Home Plan that best suits you. 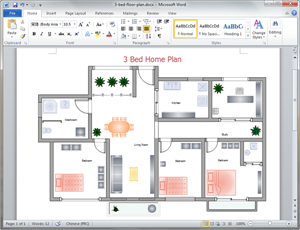 After finishing a home plan, one click on the Export button will transfer your drawing into MS PowerPoint presentation. Few things need to be considered when planning out a home plan. In order to customize the template as the way you need, you have to download Edraw and edit it. All templates in the software gallery windows can easily change color, theme and effect to fit your specifications. All are simple, converting your home plan template into PDF needs only a single click. 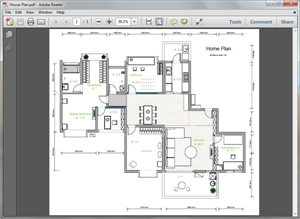 Check out house layout designer and home floor plan software here. Moreover, learn house floor plan design here. 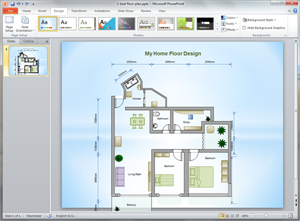 You can view the PDF Home Plan Template to view the quality. Use pocket doors to save space. Increase the ceiling height and add floor-to-ceiling cabinet. Use the nooks and crannies. Create double-duty rooms that pack a lot of function into a small space. A custom home is one way for homeowners to fulfill the dream of designing their own home, while a great home plan software facilitate you to create visualizations to better present design intent and save time. With extensive pre-defined floor plan symbols and an intuitive drawing interface, Edraw is your best choice for home plans. 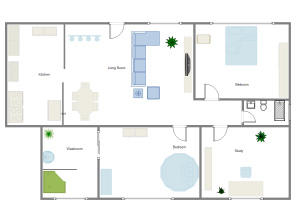 Have a try of this amazing home plan tool right now! Discover why Edraw is an excellent program to create home plan. Try Edraw FREE.